The 1985 United States Football League season had been a rough one for Jacksonville Bulls QB Brian Sipe as he prepared to take the field on May 20 against the Houston Gamblers. 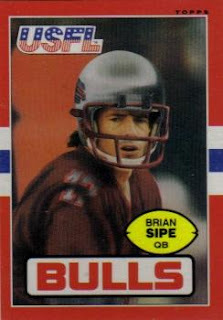 Sipe, once the NFL’s Most Valuable Player with the Cleveland Browns in 1980, had been signed to the USFL by the New Jersey Generals in ’84, and was unceremoniously dumped off to the Bulls after Heisman Trophy-winner Doug Flutie signed with the Generals for 1985. Taking over as starting quarterback for Jacksonville, he had suffered a severe shoulder separation in the season-opening game and Ed Luther had been behind center as the team got off to a 6-6 start. Head Coach Lindy Infante’s team had a fine tandem of wide receivers in Alton Alexis and Perry Kemp and also benefited from the presence of RB Mike Rozier, who had spent his rookie season in ’84 with the Pittsburgh Maulers. The defense was improved due to the play of DE Keith Millard and LB Vaughan Johnson. The Week 13 opponents, the Gamblers, were coached by Jack Pardee and boasted the USFL’s most explosive offense, led by second-year QB Jim Kelly. However, after being well-supported by the Houston fans in their inaugural ’84 season, the announced move to the fall for 1986 significantly dampened attendance during 1985. For the Monday night game, there were just 17,127 in attendance at the Astrodome – the crowd was especially disappointing since there was a promotion in which, if there were at least 40,000 present, a selected fan would win a $1 million annuity ($10,000 if there were at least 35,000). Houston nevertheless started off the scoring in electrifying fashion as WR Gerald McNeil returned a punt 49 yards down the middle of the field for a TD. The Bulls drove to the Houston one yard line but two penalties and a sack of Sipe forced them to settle for a field goal. Brian Franco was successful from 29 yards and the score was 7-3 after a quarter of play. Toni Fritsch added a 44-yard field goal for the Gamblers at just over five minutes into the second quarter and Kelly connected with slotback Richard Johnson for a 15-yard touchdown. Late in the first half, the Bulls drove to the Houston 23, helped along by two pass interference penalties, but SS Luther Bradley intercepted a Sipe pass to end the threat with 10 seconds remaining. Houston was ahead by 17-3 at the half, but the Bulls took control in the third quarter. The defense allowed the high-powered Gamblers to gain just four net yards while holding the ball for a total of 4:35 during the entire period. Meanwhile, Sipe threw two TD passes during the period. The first covered 22 yards to Alexis and the second came just over two minutes later on a five-yard toss to RB Larry Mason. With 40 seconds left in the quarter, Franco kicked a 27-yard field goal and it proved to be the winning margin. Houston did threaten once more during the fourth quarter, driving to the Jacksonville 30, but RB Todd Fowler fumbled the ball away with just under six minutes remaining in the contest, LB Terry Beeson recovering for the Bulls. Jacksonville hung on for the 20-17 win. The Bulls had more first downs (19 to 15) although Houston had more total yards (331 to 309), but only 19 yards on 12 carries came on the ground. Jacksonville had a better-balanced attack and led significantly in time of possession (36:27 to 23:33). The Gamblers turned the ball over three times and were penalized on nine occasions while the Bulls turned the ball over just once. Brian Sipe completed 14 of 32 passes for 191 yards with two TDs and an interception. Mike Rozier led the Bulls with 86 yards on 20 carries, putting him over a thousand yards for the year (he ended up second in the USFL with 1361). Perry Kemp caught 4 passes for 82 yards. Jim Kelly had a rough outing against Jacksonville’s defense, completing 23 of 39 passes for 312 yards while being twice intercepted and sacked five times. Gerald McNeil had 5 pass receptions for 65 yards, WR Scott McGhee added 5 for 65 yards, and Richard Johnson contributed 63 yards on his four catches. Todd Fowler was Houston’s leading ground gainer with just 14 yards on 5 attempts, and had the costly fumble late in the contest. Jacksonville ended up with a 9-9 record that placed sixth in the Eastern Conference. Houston made the playoffs by finishing third in the Western Conference at 10-8, although the Gamblers lost in the first round of the postseason for the second straight year. The come-from-behind win proved to be a last hurrah for Brian Sipe, who suffered another injury and ended up completing just 55 of 89 passes for 685 yards with four touchdowns and two interceptions in what ended up being his final pro season.